When you’re just getting started playing online casino poker, you may find it hard to win consistently until you’ve mastered the fundamentals. This includes not only knowing the rules of the game and poker hand rankings by heart, but also to understand basic strategy of poker – such as knowing when to use poker blinds to your advantage. Understanding poker blinds and how to best use them is one of the easiest and simplest shortcuts to increase your competitive edge, as a novice player. So before getting back to your favourite online casino uk, make sure you read through this article to learn about poker blinds and how to use them to increase your bottom line. For anyone still learning how to play poker, a working understanding of poker blinds will be an invaluable asset to propel you beyond basic strategy in a poker and towards the highest stakes available from your online casino uk. You can learn this in five minutes and it will be useful for as long as your play online casino poker! Let’s get started? So what exactly are poker blinds and why is it important? Is games of poker like Texas Hold’em, there are two positions called the big blind and the small blind. Typically, these are rotating positions that are assigned to the two players sitting to the left of the dealer (which is also typically a rotating position). 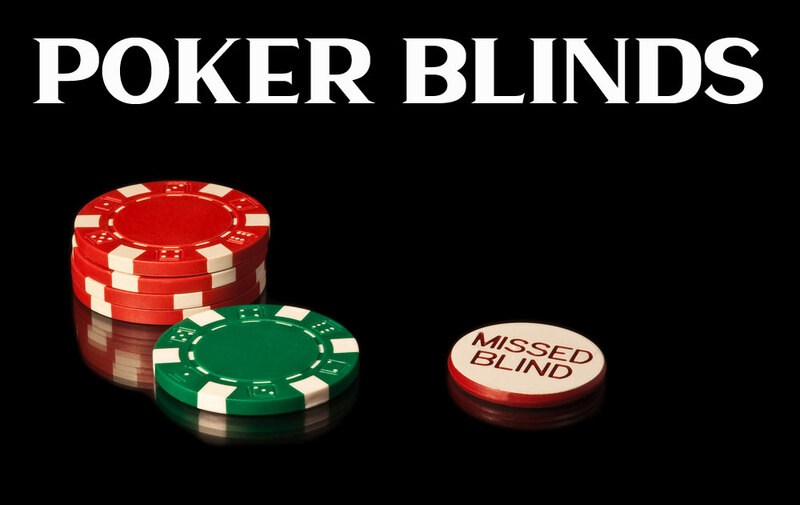 The player sitting next to the dealer for the current round is called the small blind; the player to the left of the small blind is called the big blind. When there are only two players on the table, the player holding the button doubles as dealer and small blind, while the other player takes the role of big blind. So what exactly is a blind, and why does it come in two sizes? Simply put, a blind is a kind of fee imposed to keep the game moving and to force all players to make a bet every now and them, thus ensuring there is always some wagering money in the pot. The term “blind” simply implies the person holding this role for the present round will be paying to join the hand before they actually get see any community cards… in other words, it’s simply a blind bet. The value assigned to the big blind is the same amount as the minimum bet, while the small blind is half of that amount (normally rounded down to match available chips). At this point you may be wondering how exactly you can use the blinds to your advantage during a game of poker. Typically you’ll do it by stealing blinds from cautious players as well as by keep yourself from throwing money away to chase your own blind bet. The first thing to keep in mind if you want to use blinds to leverage your winnings: never feel compelled to join a hand simply because you’ve already paid a blind. You should only join a hand if you feel you have a strong hand. Too many players lose big money trying to recover the meagre blind chips they paid to see the cards. This is a very common mistake! You will be wiser to just think of the blinds as an admission tax to sit at the table, and think of your bets as separate affairs. The second thing you will be doing to actively profit from blinds is to devise a strategy that allows you to steal blinds from other players. To achieve this effect – appropriately called blind stealing – it usually involves raising the bet before you see the flop, aiming to push other players into giving up on the hand and effectively allowing you to steal the blinds. Since experienced players will be more likely to sacrifice their due blinds in order to cut losses short (as opposed to rising on a weak hand and risking substantial losses), this strategy can indeed be profitable if you time it right and use it wisely. Especially since from a statistical standpoint, as many as 90% of the small blind players will fold when confronted with a pre-flop raise, and nearly half of the big blind players will also tend to fold depending on their total number of chips and the general game situation. If you become proficient at stealing blinds, you have a solid chance of really turning a profit even before you become a poker expert! Since this is a relatively basic strategy in poker, you should be able to start using it to your advantage immediately. Go ahead to your favourite online casino UK and try stealing some poker blinds and see how it works for you.